Note the images and video below. This article focuses on glenohumeral joint dislocation. Although acromioclavicular (AC) joint separations are sometimes called shoulder dislocations by nonmedical persons, these are not true shoulder dislocations. 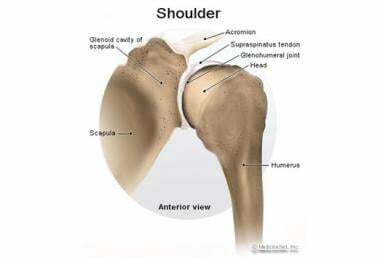 Shoulder dislocations occur when the head of the humerus comes out of its socket, the glenoid. When dealing with shoulder instability, obtaining 2 orthogonal views of the shoulder is imperative. Magnetic resonance imaging (MRI) can show damage to ligaments that may be torn with shoulder dislocation. They are better seen with the injection of contrast into the joint before the MRI evaluation. The bony architecture on these studies can also be appreciated. The most important treatment of an acute shoulder dislocation is prompt reduction of the glenohumeral joint. [1, 2, 3] Numerous reduction techniques have been described that can be performed after administering an intra-articular injection or after putting the patient under conscious sedation. After determining the direction of the dislocation, the physician must remember that the most important aspect of reduction is relaxation of the shoulder musculature. Once reduction has been accomplished, postreduction radiographs are necessary to verify reduction. In the acute phase of a dislocated shoulder, therapy should be limited. The arm should be immobilized in a sling and swathed for 1-3 weeks. While the patient is in the sling, elbow, wrist, and hand range of motion (ROM) should be encouraged. Working with the parascapular muscles is also important during this acute phase of rehabilitation, since this can be initiated while the patient is still in the sling. These exercises should be continued when the patient comes out of the sling. Active and passive flexion, extension, abduction, and internal/external rotation begin at about the third week, when the patient comes out of the sling. After the initial period of immobilization, passive ROM exercises should begin. More vigorous therapy can be initiated after full passive ROM has been regained, usually after 6 weeks. In patients who have recurrent shoulder instability, operative care should be highly considered. [4, 2, 5] The goal of an operative repair is to reattach the torn tissue back to the place where it tore off of the bone. Recurrent shoulder dislocations also stretch out the ligaments. It is imperative to also address the tissue laxity during the operative procedure. For patient education resources, see the Breaks, Fractures, and Dislocations Center and Sports Injury Center, as well as Shoulder Dislocation and Shoulder Separation. Although most shoulder dislocations occur anteriorly, they may also occur posteriorly, inferiorly, or anterior-superiorly. 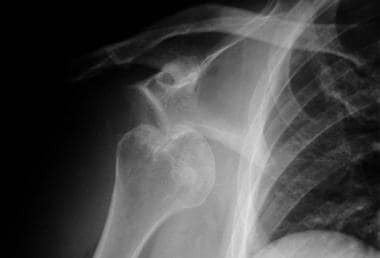 Patients with a previous shoulder dislocation are more prone to redislocation. This occurs because the tissue does not heal properly and/or because the tissue stretches out and becomes more lax. Other factors that show a clear correlation to redislocation are the age of the patient and concomitant rotator cuff tears and fractures of the glenoid. Younger patients (teenagers and those aged 20 years) have a much higher frequency of redislocation than patients in their 50s and 60s. Many physicians believe that age is less of a predisposing risk factor for redislocation than activity level. Patients who tear their rotator cuffs or fracture the glenoid during their shoulder dislocation have a higher incidence of redislocation than patients without these problems. Shoulder stability is maintained by the glenohumeral ligaments, the joint capsule, the rotator cuff muscles, the negative intra-articular pressure, and the bony/cartilaginous anatomy. The main stabilizers of the shoulder joint are the ligaments and the capsule complex. Multiple ligaments are present, but the inferior glenohumeral ligament is the most important and the one most commonly injured during an anterior shoulder dislocation. The injury may be a tear of the ligament/capsule off one of its bony attachments, and/or it may cause a stretch injury to these structures. Tears in the rotator cuff muscles may also lead to shoulder instability. Four rotator cuff muscles (supraspinatus, infraspinatus, subscapularis, and teres minor) are present in the shoulder. They are found on top of the glenohumeral ligaments and the bones. Large rotator cuff tears may lead to shoulder instability, even with intact glenohumeral ligaments. Instability of the shoulder can also occur from injury to the nerves that control the shoulder muscles, specifically the axillary nerve. The shoulder is a very mobile joint; therefore, it is often placed in awkward positions during sports (specifically abduction and external rotation). Thus, the force from a fall or a blow may be sufficient to cause damage to the ligaments. If the force is strong enough, the athlete may tear the ligaments/tendons, fracture the glenoid or humerus and from this, dislocate the shoulder. Matsen FA III, Thomas SC, Rockwood CA Jr. Anterior glenohumeral instability. Rockwood CA Jr, Matsen FA III, eds. The Shoulder. Philadelphia, Pa: WB Saunders Co; 1990. Vol 1: 526-622. Schenk TJ, Brems JJ. Multidirectional instability of the shoulder: pathophysiology, diagnosis, and management. J Am Acad Orthop Surg. 1998 Jan-Feb. 6(1):65-72. [Medline]. Cofield RH, Kavanagh BF, Frassica FJ. Anterior shoulder instability. Instr Course Lect. 1985. 34:210-27. [Medline]. Cox CL, Kuhn JE. Operative versus nonoperative treatment of acute shoulder dislocation in the athlete. Curr Sports Med Rep. 2008 Sep-Oct. 7(5):263-8. [Medline]. Blasier RB, Guldberg RE, Rothman ED. Anterior shoulder stability: Contributions of rotator cuff forces and the capsular ligaments in a cadaver model. J Shoulder Elbow Surg. 1992. 1:140-50. Hovelius L, Augustini BG, Fredin H, et al. Primary anterior dislocation of the shoulder in young patients. A ten-year prospective study. J Bone Joint Surg Am. 1996 Nov. 78(11):1677-84. [Medline]. Kardouni JR, McKinnon CJ, Seitz AL. Incidence of Shoulder Dislocations and the Rate of Recurrent Instability in Soldiers. Med Sci Sports Exerc. 2016 Nov. 48 (11):2150-2156. [Medline]. Burkhead WZ Jr, Rockwood CA Jr. Treatment of instability of the shoulder with an exercise program. J Bone Joint Surg Am. 1992 Jul. 74(6):890-6. [Medline]. [Full Text]. Itoi E, Hatakeyama Y, Urayama M, Pradhan RL, Kido T, Sato K. Position of immobilization after dislocation of the shoulder. A cadaveric study. J Bone Joint Surg Am. 1999 Mar. 81(3):385-90. [Medline]. Itoi E, Sashi R, Minagawa H, Shimizu T, Wakabayashi I, Sato K. Position of immobilization after dislocation of the glenohumeral joint. A study with use of magnetic resonance imaging. J Bone Joint Surg Am. 2001 May. 83-A(5):661-7. [Medline]. Itoi E, Hatakeyama Y, Kido T, Sato T, Minagawa H, Wakabayashi I, et al. A new method of immobilization after traumatic anterior dislocation of the shoulder: a preliminary study. J Shoulder Elbow Surg. 2003 Sep-Oct. 12(5):413-5. [Medline]. Itoi E, Hatakeyama Y, Sato T, Kido T, Minagawa H, Yamamoto N, et al. Immobilization in external rotation after shoulder dislocation reduces the risk of recurrence. A randomized controlled trial. J Bone Joint Surg Am. 2007 Oct. 89(10):2124-31. [Medline]. Liavaag S, Brox JI, Pripp AH, Enger M, Soldal LA, Svenningsen S. Immobilization in external rotation after primary shoulder dislocation did not reduce the risk of recurrence: a randomized controlled trial. J Bone Joint Surg Am. 2011 May. 93(10):897-904. [Medline]. Olds M, Ellis R, Donaldson K, Parmar P, Kersten P. Risk factors which predispose first-time traumatic anterior shoulder dislocations to recurrent instability in adults: a systematic review and meta-analysis. Br J Sports Med. 2015 Jul. 49 (14):913-22. [Medline]. Boggs W. Several Risk Factors Predict Instability After Anterior Shoulder Dislocation. Reuters Health Information. Available at http://www.medscape.com/viewarticle/844400. May 11, 2015; Accessed: August 28, 2015. Hohmann E, Tetsworth K, Glatt V. Open versus arthroscopic surgical treatment for anterior shoulder dislocation: a comparative systematic review and meta-analysis over the past 20 years. J Shoulder Elbow Surg. 2017 Oct. 26 (10):1873-1880. [Medline]. McIntyre K, Belanger A, Dhir J, et al. Evidence-based conservative rehabilitation for posterior glenohumeral instability: A systematic review. Phys Ther Sport. 2016 Jun 7. 22:94-100. [Medline]. Jouve F, Graveleau N, Nove-Josserand L, Walch G. [Recurrent anterior instability of the shoulder associated with full thickness rotator cuff tear: results of surgical treatment] [French]. Rev Chir Orthop Reparatrice Appar Mot. 2008 Nov. 94(7):659-69. [Medline]. Orloski J, Eskin B, Allegra PC, Allegra JR. Do all patients with shoulder dislocations need prereduction x-rays?. Am J Emerg Med. 2011 Jul. 29(6):609-12. [Medline]. Pouliart N, Gagey O. Consequences of a Perthes-Bankart lesion in twenty cadaver shoulders. J Shoulder Elbow Surg. 2008 Nov-Dec. 17(6):981-5. [Medline].